1. Contains high quality whey milk ingredients with skimmed milk powder resulting in efficient absorption of the high protein levels. » Increases the growth of intestinal micro flora. » Reduces the incidence of digestive scours. » Minimises the growth of harmful bacteria including E-coli, Clostridia and Salmonella. 3. Developed for modern dairy units and beef enterprises resulting in very cost effective growth rates. 4. TURBO THRIVE is an easy mixing calf milk replacer, ideal for once a day, twice a day feeding, computerised and ad lib calf rearing systems. 5. Available in pallets of 20kg polylined paper bags. 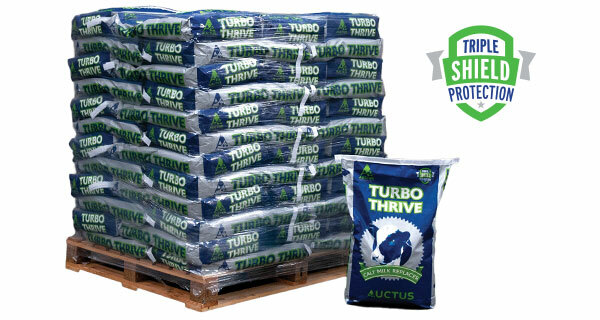 To download TURBO THRIVE Calf Milk Replacer product information, click here.